Bill Schueler (schueler_emt@hotmail.com) sent in this one. "I took some digital photos while I was at The DCI Midwestern Championships on Saturday, July 12. Excellent job by all the corps. Madison Scouts are back! I marched Pioneer in 1998-1999, played in the pit, more specifically timpani. 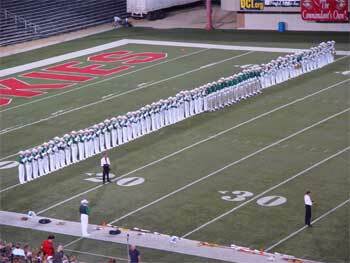 "Seeing shows makes me miss doing drum corps and I wonder where I can fit it in my life in the future. But being an ER nurse in Milwaukee takes up a lot of my time!" Thanks Bill! E-mail your Forzato submissions -- and we will get to them all, in time -- to dave@dci.org along with where and when the photo was taken. Send some biographical information about yourself as well. We'll give you full credit. Also, let us know if you want your e-mail address included, to get feedback from other drum corps fans.